2010 appears to be the year that saw citizens far more engaged in the political process than they have been for decades. Similar to the 1960s, when questioning the government became de rigueur, this year has seen citizens involved in public forums, the election process, and many local issues that have come before local governments. Taxpayers want to know where their money is going and what it is being spent for. She mentioned that participation might make some people uncomfortable. What do you think? Mr. Bennett wanted the community to unite behind Sterling Chemical when he was Chairman of the Lowndes County Commission. Mr. Bennett's son receieved employment by Sterling after the Commission brought Sterling here. Subsequently Mr. Bennett and all Commissioners except Joyce Evans were voted off the Commission. 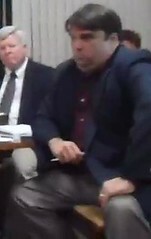 Mr. Bennett is married to Dr. Robin Bennett, the principal at Moulton-Branch Elementary, the closest school to the proposed biomass incinerator. I'm sure the parents of those schoolchildren are asking some tough questions right now. I would imagine both Mr. and Dr. Bennett would like the community to unite in favor of the biomass incinerator but that is not going to happen.